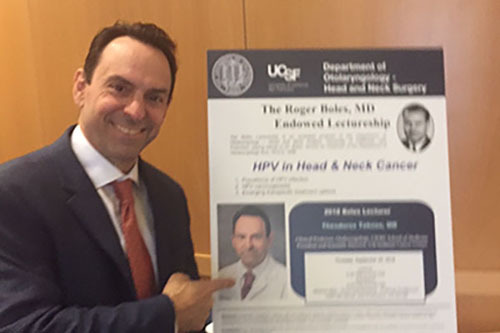 On September 20th, an invited guest speaker, Theodore Teknos, MD, gave the annual Roger Boles, MD, lecture, presenting on the topic of human papillomavirus (HPV) in Head and Neck Cancer to a large audience in Rock Hall’s Pottruck Auditorium at the Mission Bay Campus. OHNS Chairman, Andrew Murr, MD, gave an introduction to the lecture that discussed Roger Boles, MD and his many contributions to UCSF and the Department of Otolaryngology-Head and Neck Surgery. Dr. Patrick Ha, Chief of the Division of Head and Neck Oncologic Surgery, introduced Dr. Theodore Teknos. Theodoros (Ted) Teknos, MD, is the President and Scientific Director for the Seidman Cancer Center at University Hospitals Cleveland Medical Center and Deputy Director of the Case Comprehensive Cancer Center. He is a Clinical Professor in the Department of Otolaryngology-Head and Neck Surgery at the Case Western Reserve University School of Medicine. The Boles Lecture series is dedicated to the memory of Roger Boles, MD, the former Chair of UCSF’s Department of Otolaryngology – Head and Neck Surgery. Dr. Boles, served as Chair for 15 years, from 1974-1989. He was an expert physician and surgeon, a dedicated teacher, and an extraordinary leader. The Roger Boles, MD Endowed Lecturer series serves to continue UCSF’s dedication to research, education, and service in Dr. Roger Boles’ name.